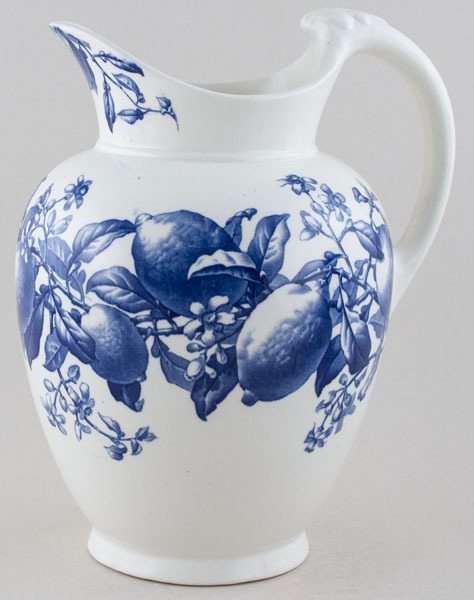 A most unusual large ewer showing the fruit and flowers of a lemon tree. Backstamp: BWM & C Lemonaire Rd 16496 (this registered design number would appear to be a mistake as it relates to a pattern called Morocco!) and impressed Brown Westhead Moore. There is a little wear inside the spout and underneath to the foot, also to the foot a small hairline. Sounds much worse than it looks and is sound to hold water making it a wonderful container for fresh flowers. OVERSEAS SHIPPING OUTSIDE EUROPE Owing to the size of this item a supplement of � about US$52 will be added to the standard overseas shipping charge.